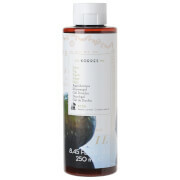 KORRES Vetiver Root, Green Tea and Cedarwood Showergel 250ml refreshes and rejuvenates men's skin with almost 90% natural active ingredients. Best New Body Product Winner in the GQ Grooming Awards; this is the back-to-nature answer to the question of older looking skin. The refreshing purity of green tea extract combined with the naturally rich, sensual aromatic oil of vetiver root and an anti-ageing blend of wheat-based proteins protect and hydrate tired skin. The confidence inspiring scent of cedar wood makes this KORRES shower gel for men the ideal preparation for a day in the office, on the road, or anywhere a man has to be at his best. Aqua/Water/Eau, Sodium Laureth Sulfate, Cocamidopropyl Betaine, Sodium Cocoyl Isethionate, Parfum (Fragrance), Coco-Glucoside, Glyceryl Oleate, Aloe Barbadensis Leaf Juice, Alpha-Isomethyl Ionone, Althaea Officinalis Root Extract, Arginine, Benzyl Alcohol, Castoryl Maleate, Coumarin, Guar Hydroxypropyltrimonium Chloride, Helichrysum Arenarium Flower Extract, Hydrolyzed Wheat Gluten, Imidazolidinyl Urea, Lactic Acid, Limonene, Linalool, Phenoxyethanol, Polyquaternium-7, Potassium Sorbate, Sodium Chloride, Sodium Dehydroacetate, Sodium Gluconate, Tocopherol. This Is an excellent product with a very pleasing aroma and makes an excellent lather with very little. I can highly recommend this product. I like this shower gel but I purchased it initially thinking it was organic - I was trying to get away from products containing sls due to skin reaction- and while most of the ingredients are, it still contains sodium laureth sulphate, which takes away from a good product. It would be good if all products on mankind had their ingredients listed under description. 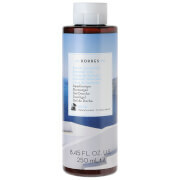 I have always been a fan of Korres products, particularly their shower gels and this is a great addition. 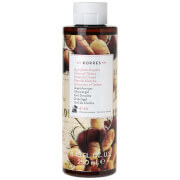 It smells really fantastic, lasts a long time and doesn't irritate my skin like most others do. It is not quite as good as Juniper & Rum, but until they bring that back it is my new favourite. I love these shower gels as they lather really well and smell great. I'd recommend.